It’s a good thing we’re almost to my birthday, I feel like I might be running out of Random Things About Me :). Be sure to check out the first post in this series: 31 Random Things About Me. 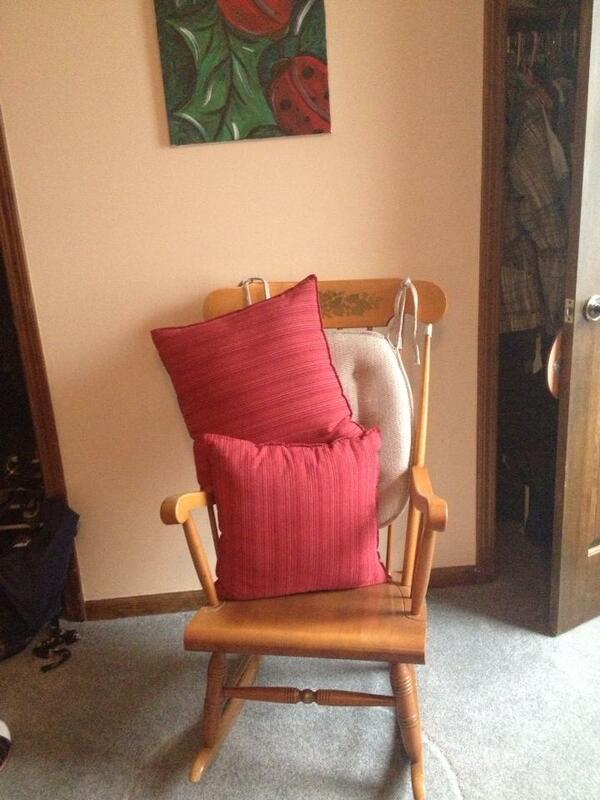 My rocking chair that used to sit in Grandma Shirley’s living room. I can still picture her sitting in it working on some project or looking out onto the lake. 18. I absolutely love listening to music. I do not know many people that do not like listening to music but I love listening to music. I get inspiration from music and I worship with music. I love singing in the car and listening to tunes either walking or driving to a destination. I love reading with music on or knitting or doing just about any activity. I love artists that are played on popular music stations as well as artists that are not as well known. Some of my favorite artists at the moment are: Pink, Fun, Scars of 45, NEEDTOBREATHE, Big Daddy Weave, Florence + The Machine, Lumineers and Johnny Cash and old stuff from Ozzy Osbourne. 🙂 I have an eclectic taste in music. *the Science or psychology behind what I am saying came from Terry and Sharon Hargrave. I just adapted it to my situation. Last night I had an argument, an argument over nothing and my reaction caught me by surprise. I haven’t felt this angry over nothing in a long time. It reminded me that heated arguments are rarely about the actual thing you are arguing over. Most of the time they are over the way the person felt, or how the other person’s actions made the person feel. For instance, in this particular argument I felt like a cornered cat. There was no option for me other than to agree with the person. There was no where to go but to agreement and I was not ready for that yet. The other person even pointed out that I was overreacting to the situation. So what about the argument was different or what made it more heated for me. I felt cornered. I felt like a kid getting a spanking for a dumb reason. When I feel cornered I protect myself and lash out, which is exactly what I did. Each of us have our own reactions to be cornered. Some people will just agree so they can get out of the corner and other’s like me will lash out. Like I said the argument was a silly one. One that over the time of about a half hour I was able to get over. My reaction was what surprised me. So I thought over the conversation. The person I was arguing with never said that I was dumb, yet I felt it. The person never said that was being a child, but I felt like one. The person never gave me a choice. The person did say I could run an experiment but it was said in a way that makes the other person (me) feel like a child. Had the person, or myself, stopped the conversation for a moment, googled the information and then shown me the webpage that proved that they were right things might have gone differently. I may not have gotten so heated. But I was tired and when I am tired I kind of forget all the things I have learned and go straight to angry. Terry and Sharon Hargrave taught that instead of going straight to the reaction we should try to first go for the feeling. When so and so did this I felt…. When so and so stated the information in what felt like a condescending way I felt small. When so and so continued to argue their point without back up I felt angry. When so and so would not give up I felt cornered. Once you do three feelings then you are supposed to talk about your reaction. When so and so would not give up I felt cornered and lashed out with words of anger. I came back with a reasoned argument but ended with the lashing out again in a semi-sarcastic manner. What I should have done is come back with an explanation of what I heard (because sometimes what we hear is not what was said) and then explained how each statement made me feel. The Hargraves also reasoned that you could use this system to find out how your argument partner (or spouse) fights or reacts to fights and how to best approach them to finish the argument in a way that has neither partner reaching for their flight or fight response. They cautioned that you were not to use the system as a way to manipulate your partner but instead to better understand them and yourself. So my argument last night was not about the argument itself but instead about how the argument made me feel. I have a feeling that being away from my California therapist and California friends will teach me how to use all the different skills I have learned in a new way. I will get chances to put everything I have learned into use because no one here has taken the classes I have taken and no one here has been to all the seminars I have been to. This might be a hard year because I might have to stop myself and figure out what is going on before lashing out and protecting myself. Ahh new lessons, why do they have to be so hard?